Technicolor opens with the quirky and cleverly written “Tower of Babel,” which sets an intriguing backdrop for the EP. And two things are immediately made clear about Claire and the Crowded Stage. First, the band’s handler, Claire Adams, does not need a crowded stage to capture an audience’s attention—her voice alone will do the job. And, second, nothing about this band is superficial. Its music is a unique combination of raw emotion and refined sound. The nine-piece, coupled with Adams’s knack for songwriting and compelling vocals, radiates with talent and versatility. Adams’ vocals haunt the heart-wrenching “Tower of Babel” [and “Tower of Babel (minimal mix)”] as she sings: “I never lost you / You were never mine.” The strong piano, clarinet, and accordion parts make the ballad memorable and unique. The album’s title track, “Technicolor,” is perhaps the most danceable track on the EP. It carries a rolling-‘20s-esque feel—breaking out into the jitterbug certainly wouldn’t be inappropriate. “Songbird” starts slow and instrumental with an exotic sound unlike any other on the EP. About halfway through the track, however, the tempo, chords and mood change completely and the song becomes very upbeat. It’s another example of the group’s ambidextrous abilities. Claire and the Crowded Stage is full of enduring talent that will only get better with time. This isn’t just a group of musician friends who are aimlessly plucking away on guitars or noodling around on a piano. Their sound is purposeful and polished. They weren’t thrown together by accident; this crowd was brought about to give local music a good name. Technicolor, the group’s second EP, was released January 5. 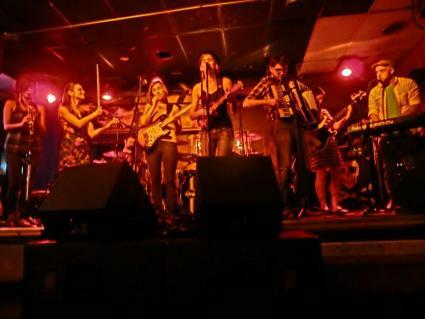 Claire and her crowded stage comprises: Claire Adams (vocals, ukulele and guitar), Katelyn Boone (bass and keys), Pete Lawless (accordion and saxaphone), Meredith McGrade (electric guitar), Katy Guillen (electric guitar), Stephanie Williams (drums), Jerod Rivers (drums), Brent Jamison (keys) and Teri Quinn (clarinet and guitar). As is par for the course of being a musician in Kansas City, several of these band members can be found hopscotching from lineup to lineup and venue to venue across the city. You'll be able to listen to Claire and the Crowded Stage on 90.1 KKFI next Wednesday, March 27 at 11:15 a.m. Members will be performing live on Mark Manning's weekly show, Wednesday MidDay Medley. The group will next be crowding the Coda stage on Friday, March 29 with Rev Gusto. Facebook event page here. Alex Peak is a magazine designer by day and a music listener by night. To her, stumbling across great new music is even better than finding a $10 bill floating around in the laundry.